HomeExperience LevelAllAre Pitching Underhand and Overhand Any Different? We all know how important it is to have good pitching, but pitching is too complicated for most of us to teach it. Or is it? You might be surprised to learn that pitching overhand and underhand are almost identical. We’ve made pitching so complicated we don’t think we can teach it. I think that’s crazy. Softball pitching isn’t much different from baseball pitching or simply throwing overhand. If you don’t believe me, then check this out. In my newest eClinic, The Comprehensive Pitching Blueprint, I show a video overlay of a baseball pitcher and a softball pitcher. This is an incredibly powerful video because everyone who sees it takes a deep breath and realizes how much pitching underhand resembles throwing overhand. Before this video, I always felt these two skills were similar, but I only had my gut to go on. Now, I’ve got proof, and it’s compelling! 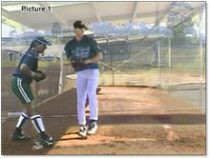 The video starts with the picture on the right – both pitchers at their belt and ready to start their particular motion. Even this picture starts to show some similarities, although slight. Looking at the 3 pictures below shows that while the softball pitcher starts a little farther back, both pitchers end up with identical positions on their stride leg, drag leg, glove position and in the Entering Release and Follow-Through – even their throwing arm positions are the same. Freaky, isn’t it?! Too often we separate skills and teach them as if their movements exist in a silo, when in fact, hitting, pitching and throwing pretty much involve the same body movements, simply on different planes. We would better assist our players by tying the skills of throwing, hitting and pitching together, rather than separating them and making each one seem so complicated and unique. Sure, there are nuances to each of these skills that may not be in the others, but those are advanced layers we should only add when our players are ready for them. Simplify your coaching by connecting the dots for your players. Making things more complicated doesn’t make you smarter, it just makes your players more confused. Become a Vault Classic member today!